Sony’s first attempt at a console is one of the best gaming products of all time. It put Sony on the map in gaming land, ready to take over the world with the PlayStation brand for the last two decades. The PlayStation 2 may be fondly remembered while the PS4 Pro is the pinnacle of console gaming right now, but there is a lot of great stuff about that first console we should remember too. TechRadar readers have voted the original PlayStation one of the best consoles of all time, so here’s why we love Sony’s early '90s attempt at taking over your living room. The launch of the original PlayStation was elongated – it came out in Japan a whole nine months before the rest of the world got to play it, but it managed to have a life lasting over 11 years. Launching in the west in 1995, games were still being made for the console in 2006. That's an incredible legacy and meant PS1 games were still being made only a year before the launch of the PS3. The original PlayStation had tough competition too - it had to compete with the new Sega Saturn and Atari Jaguar at the same time. A year after the initial release Nintendo was also back with the N64. How did Sony succeed in such a tough home entertainment system battle? It made sure third-party developers wanted to create games for the platform. While Sega and Nintendo were both focusing on first-party titles involving core characters such as Sonic, Mario and a plethora of others, Sony opened the gates to a whole new range of original IPs and, crucially, new studios. Despite not producing the titles itself, there were still a series of iconic characters throughout the original PlayStation’s life that came to represent gaming throughout the 1990’s. Without the original PlayStation there would be no Tomb Raider or Crash Bandicoot as mascots for an entire console generation. Now familiar names, the franchises are as revered as the likes of Mario and friends. Enough so that Crash and Tomb Raider are now both surviving on the PS4. You can't talk about the PS1 without mentioning Final Fantasy VII either– the second most popular title on the console selling over 10 million units – that changed the face of RPGs. The interesting thing is Final Fantasy VII was originally destined for the Super NES, but Square decided to start developing for the PlayStation when the benefits of the CD-ROM format was made clear. It allowed for the RPG series to take on 3D computer graphics and make a huge jump in terms of gameplay. The PlayStation controller also changed the way we play games. The initial button setup may be based on the Super NES controller, but Sony evolved the way we control games by adding additional shoulder buttons on the back of the controller, as well as comfy grip handles. In 1997, Sony released the DualShock controller that became the handheld you'd get in the box and included the dual-joystick setup in a home console for the very first time. Looking over the PS4 controller now shows you how the design has barely changed in the last 20 years apart from minimal tweaks. 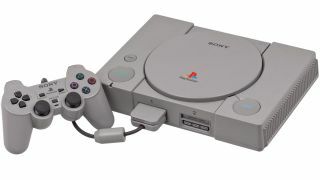 Without evening mentioning the likes of Tekken, Metal Gear, Spyro, Rayman, PaRappa The Rapper or Tony Hawk, you can see how easy it is to proclaim PlayStation as one of the best consoles of all time. The 3D re-introduction of Solid Snake after his early NES outings and the game that made Hideo Kojima a geek god is arguably the most iconic game of the PlayStation era. Metal Gear Solid helped to make the stealth genre an integral part of our gaming diets. Spawning one of the biggest games series of all time, several movies and numerous comics, novels and tons of merchandise, Resident Evil is one of the must play games of the original PlayStation. In the first game you follow S.T.A.R.S agents Chris and Jill around the outskirts of Raccoon City after the outbreak of the deadly T-Virus. Gran Turismo is arguably the most important racing game of all time and its return wouldn't be so hotly anticipated if it wasn't for this stellar first PS1 entry. It took five years to build the original Gran Turismo and is still one of the must play games of the PS1 era. From its level of detail to the depth of its options, it took driving games to a whole other level.